In our world today, it is easy to get distracted. Our gadgets have taken over our reality, keeping away our physical world from us. We no longer know how to communicate and have conversations deeply. It is all virtual nowadays. It is easy to get to something we don’t really like or we are not intended to do. All things now are available online. From the favorite tv series to the favorite shoes that you admire. 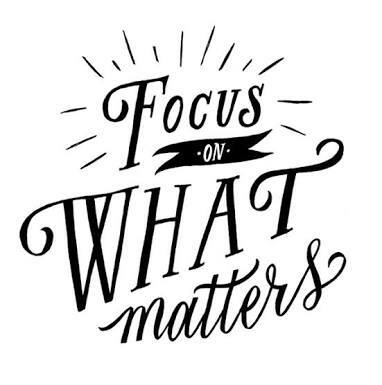 We already lost focus on what really matters to us. Spend time with your family and friends, have a deep conversation with a new found friend. Jounal every morning. We already forgot those basic things. Those candid moments like when we take pictures with our loved-ones. Write them a letter during their birthday. Send them hugs and kisses real-time, not online. Today, where everything goes fast, slow down and think about what really matter to you the most. Reflect and stay focused. Hi there! I'm a believer that everyday can be an inspiration. Grateful for having to share my stories with you.